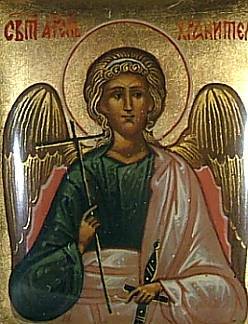 This small icon work shows a Guardian Angel in the center bearing a cross in one hand and a sword in the other. The composition is small, but its impact is big. The piece features masterful painting and a background of radiant gold leaf, which seems just a little bit darker than usual and looks very attractive. It is done on a small piece of high quality papier mache that sits recessed in a small structure made out of german silver. 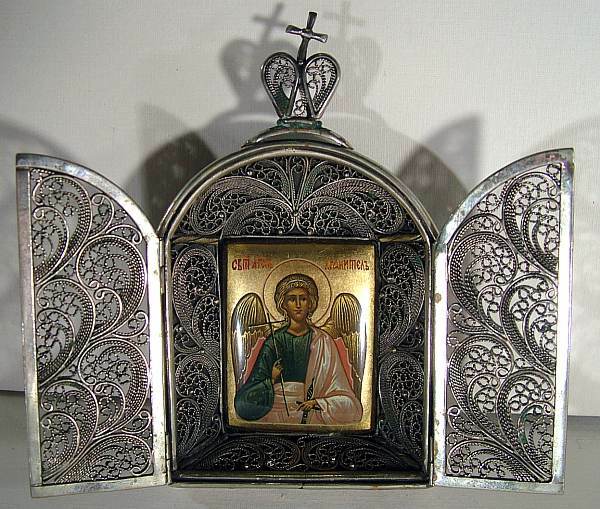 The two flaps can be closed and latched into place to protect the angel. In back, there is a small metal piece that can be pulled out so that the icon can sit vertically, though one of the hinges is broken. (It could be fixed if one knew how to weld. In any case, the icon can stand up just fine with one of the hinges, or placed on a separate stand.) We know the work came from the village of Palekh, but it is not signed, in accordance with the tradition of icon painting.